This is not intended to serve as a definitive list of the best specific locations, simply ten of my favourite places for photography. If you are surprised at the omission of one of your favourite places and would like to share it with us please feel free to leave a comment below. Cala D'en Serra is located in the far north of the island near the resort town of Portinatx and in my opinion it is one of Ibiza's hidden gems. Most people couldn't fail to appreciate the wonderful natural beauty of the cove but for me it is improved as a photographic location by the presence of Josep Lluis Sert's huge abandoned hotel complex. Some people complain that the hotel "ruins" Cala D'en Serra however I find it gives great opportunities to juxtapose the grimy urbex feel of the derelict hotel with stunning views over the bay and provides a spectacular demonstration of the power of nature, as the site is being comprehensively reclaimed by pine woodland after only a few decades. Camino General can be found within walking distance of the centre of San Antonio. Until the rise of tourism and the huge improvements in Ibiza's road network Camino General was one of the most affluent farming areas on the island. Back in the days when most farmers faced arduous journeys over rutted tracks by horse and cart to sell their wares at the local village market the farmers on Camino General were within commuting distance of San Antonio. Up until the 1950s an Ibizan landowner's wealth was easily ascertainable by the number and size of his windmills and the quality of his irrigation systems and Camino General is laden with derelict windmills and wells. To me a wander down Camino General is a must for anyone with an interest in rural exploration that finds themselves in San Antonio. Unfortunately parking is not easy as it is not a recognised tourist destination and the majority of the rural heritage lies on private property, however most Ibizencos are accommodating and won't mind you taking photos of their old wells, derelict windmills, vineyards and citrus plantations as long as you don't start trampling their crops or raiding their orange trees for a snack. Sa Talaia is the highest geographical point on the island which benefits from a reasonable access road to the top because of the presence of a number of telecommunication towers there. If you have a lot of stamina you could even try hiking your way to the top however my mind boggles at the thought of trying it in the heat of the summer. The telecommunication towers are visible from miles around and are definitely worth a snap from up close but the real highlights are the stunning panoramic views over the island. From the right locations on top of Sa Talaia you can find magnificent shots of places as far apart as San Antonio bay in the north-west to the Salinas salt flats in the south. This is not really the kind of location where a point and shoot pocket camera is going to be much use. You should ideally have a tripod and a proper SLR camera or at least a super-zoom bridge camera in order to get some really good shots. Festival Club is an abandoned and derelict 1970s nightclub in the hills near Sant Josep. It was a spectacularly ambitious development which included a nightclub, another stage a vast open air restaurant and even a bullfighting arena. The project relied on bussing in tourists from the hotels on San Antonio bay however it was never economically viable and shut down in 1974 after only operating for three summer seasons. In the intervening years natural forces and vandals have reduced the site to bleak graffiti covered ruins covered in pine trees and abandoned cars. There is no greater monument to Ibizan overconfidence than Festival Club. Sa Caleta has some of the best beaches in Ibiza and is one of the most diverse photography locations on the island. The beach and shallow turquoise waters are a great place to start especially if you have an underwater camera as there are many species of fish living in the seaweed banks. 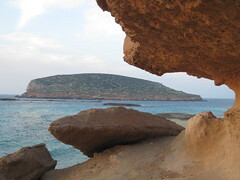 There are a number of other interesting subjects in the vicinity including the imposing deep brown sedimentary cliffs, the ancient Phoenician cliff top settlement, some abandoned 20th century gun emplacements, the ruins of the associated military buildings and a network of underground tunnels to link the military sites. Just a couple of words of warning be careful if you venture up onto the cliffs or into the dark underground tunnels and also mind out for nudists on the beaches to the north of the cove, some of them may not be too keen to be photographed. Es Vedra from out at sea. The uninhabited island of Es Vedrá is one of the most iconic images in Ibiza and regularly appears in tourist brochures about the island. Es Vedrá and the smaller island of Es Vedranell to the south are hills that are separated from mainland Ibiza by a couple of miles of sea. The effects of the Mediterranean have reduced the once rounded mesozoic limestone hills to almost vertical cliff faces. The islands have no human settlement and are recognised nature reserves and aside from being one of the most important breeding grounds for seabirds in the Balearic islands it is also home to several species of lizards and invertebrates. Es Vedrá and Es Vedranell are also home to a range of plant species including limonium ebusitanum, asperula paui, silene hifacensis, medicago sallow, diplotaxis ibicensis, lamottea dianae and euphorbia dendroides. The most common locations for photographing the islands are from the beach at Cala D'Hort and the defensive tower "torre des savinar" however wonderful shots can be taken from several miles around the Cala D'Hort area. Some of the most impressive shots can be taken on cloudy days when the cloud banks ride over the top of Es Vedrá. If you ever get the ferry from Eivissa to mainland Spain (or can afford to hire a small boat) you may be able to get some pictures from the other sea-facing side of the island. The area of Ses Salinas has a wonderfully diverse range of subjects to photograph. The area gets it's name from the ancient Phoenician salt flats that are still used to produce salt by the age old method of evaporating seawater in shallow pools and then scraping out the salt. On still days it is possible to create reflection shots in the pools and the salt mountain is always an impressive subject. Near the beach of Salinas there is an abandoned port and derelict miniature gauge railway at one end and the historic defensive tower "Torre de Ses Portes" at the other. There is another cracking beach at Des Cavallet but be careful here as it is a nudist beach. You should also keep your eyes peeled for abandoned wells, windmills and irrigation systems in the area if you are interested in photographing Ibiza's rural heritage. The ancient Phoenician quarry at Atlantis is one of Ibiza's best kept secrets. It is not sign posted and it is notoriously difficult to find without a guide or some very clear instructions. it is advisable to wear sturdy footwear such as hiking boots, take plenty of liquid and make sure to wear sunscreen and a hat if you are going to attempt the trip during the summer months. The quarry is located beneath the cliffs at Sa Pedrera and is only accessible down a steep and precarious path but the effort is truly worthwhile once you get down there. The quarry was located near the sea in order to facilitate the transportation of the hand carved stones by boat to be used in the construction of the walls of Dalt Vila, homes and defensive towers across the island. Once you have explored the quarries it is advisable to take a dip in the sea to cool off before the long climb back. If you are brave enough there are a number of points above the quarry from where you can "tombstone" into the sea below. On your way back you can also find impressive views of Atlantis from the cliffs above near the historic defensive tower "Torre des Savinar" which also provides one of the most iconic views of Es Vedra from the other side. The only way that a visitor to Ibiza could avoid a trip to see the amazing fortified hilltop town of Dalt Vila in the capital of Eivissa is through sheer determination to avoid anything cultural during a hedonistic bender involving only bars, clubs and beaches. For anyone with the slightest interest in the history and culture of the island a walk around Dalt Vila is an absolute must. Between the cathedral at the top of Dalt Vila to the gay capital of Europe around the inappropriately named "Calle de la Virgen" near the port below there are a spectacular range of scenes to photograph. There are ruins, wonderfully decaying buildings and amazing panoramic views in all directions. There is 2,000 years worth of history and architecture and a number of museums and art galleries and as well as all of this historical heritage, Dalt Vila boasts many spectacularly located hotels bars and restaurants and also plays host to a wide range of events from Eivissa Medieval Festival to the International Music Summit. Cala Conta (Platges de Comte in Catalan) is the ideal place to take sunset pictures in Ibiza because it has such a wide panorama allowing views of the sun setting over the ocean the whole year around. In winter the sun sets to the south of Illa de s'Espartar and as they year progresses towards summer solstice the point of sunset moves northwards towards Illa des Bosc. There are three beaches, lots of cliffs and interesting rock formations that glow deep orange in the evening sunlight, views of a host of islands, the defensive tower of "Torre D'en Rovira" and one of the finest pieces of graffiti art on the island at the southern bay near the nudist beach. I have strong views about Cala Conta and believe that if you find yourself unable to take beautiful pictures here then you may as well just throw your camera in the sea and give up on photography altogether. All the spots in Ibiza are great but my the one that most I like is the Dalt Vila I would like to visit there and take a photos of me standing in that place. How about the Hotel Ibiza? Is it nice to stay there?